Tone Your Life is a special & personal workshop designed to help students prepare to transition into the new year with ease and excitement. Detox Flow+Intention Setting+Sound Healing all in one workshop. Let's get 2019 started right! The workshop begins with a 60 minute lightly heated detox flow where we can shed layers of the self that are no longer serving us and let go of any unwanted feelings or resistance that is holding us back from being truly happy and free. Students will then transition into a journal reflection exercise where personal intentions will be set for 2019. The final 40 minutes of the class will be a sound healing with instruments such as didgeridoo, flute, crystal bowls & more. 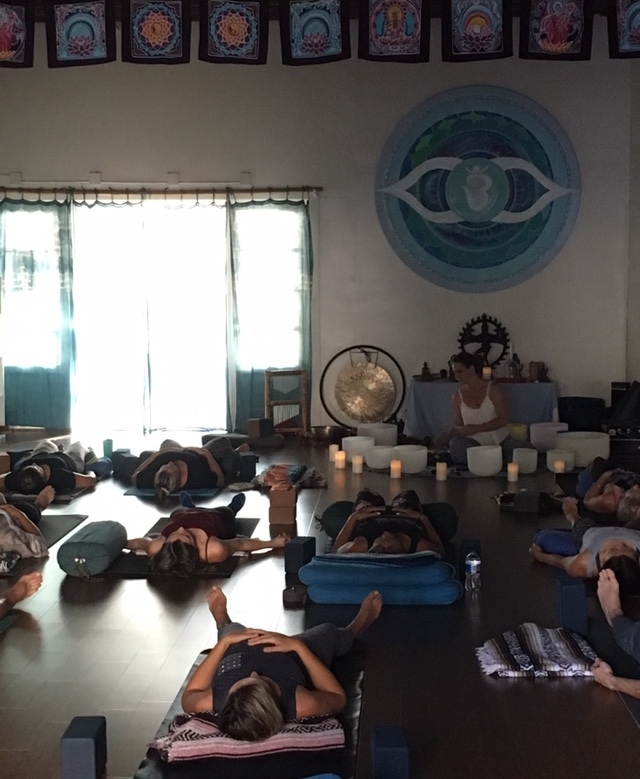 This healing sound bath is taken while opening in restorative poses and manifesting a future of bliss and love. You will leave feel toned physically, emotionally, and energetically. A little bit about our Sound Healer: Grant is forever a student of the light and of love. He is teacher of mediation, 500-RYT-yoga instructor, a natural channel for spirit, as well as a talented sound healer. Using traditional native instruments such as the Aboriginal Australian didgeridoo and Native American flutes, rattles, and drums; he taps into ancient primal sound to heal through vibration while simultaneously guiding his students through a journey of the dream world space. Grant’s mission is to provide his students with a safe healing space and guide them through a self-exploration experience while using primal sound healing, crystal healing, aromatherapy, and guided meditation.Grant is forever a student of the light and of love. He is teacher of mediation, 500-RYT-yoga instructor, a natural channel for spirit, as well as a talented sound healer. Using traditional native instruments such as the Aboriginal Australian didgeridoo and Native American flutes, rattles, and drums; he taps into ancient primal sound to heal through vibration while simultaneously guiding his students through a journey of the dream world space. Grant’s mission is to provide his students with a safe healing space and guide them through a self-exploration experience while using primal sound healing, crystal healing, aromatherapy, and guided meditation. To find out more about Jeanine go to our about tab and scroll down to see our "teachers" page.